My little 10 weeks chow chow has entropium of his right eye lid. The vet suggested that he has surgery just after his third vaccination which is in 2 weeks. He mentioned that the surgery takes 15 minutes and that his eye will be fine. 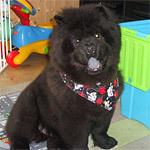 Has anyone else had similar experience with their chow? I am slightly worried that he is too young to go under full anaesthesia. Any thoughts? PS. 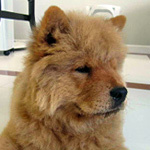 The breeder said that he would pay for the surgery but suggested that the puppy reaches six months of age first. Last edited by Drogo on Sun Aug 04, 2013 12:19 am, edited 1 time in total. I don't know what a proper age to have the surgery is. But the surgery is something that they come through easy typically. You might be able to get some type of meds for him until you are ready to do the surgery. Are you planning on neutering him eventually? If so, is this something that can wait until then? I tried looking up ectropium the way you spelled it and I get results for ectropion (which I see is a turning out of the eyelids) Is this what he has? Or does he have the much more common entropion (where the eyelashes are turning inward rubbing against the eye)? If it is entropion, I know a lot of vets wait a while to see if a puppy will outgrow it. In the meantime usually you put drops or an ointment in that eye to protect it from damage. Quite a few people on this board have had the entropion surgery which involves tacking the eye. You can do a search by the word to see previous posts. Regardless of what this particular vet said, I would get a second opinion if you are not 100% comfortable doing surgery so soon. Did you ask the vet what the risks are if you decide to wait a while? Good luck! I think that the vet is talking about doing an eyelid tack, if it's only going to take 15 minutes. This means that no cutting of the eyelid will take place, they are only going to suture the eyelid so it doesn't curl on to the eye and scratch it. This is a fairly common procedure in a young puppy with entroprian. Puppies often grow out of entroprian or it is far less when they are grown and so most vets want to wait until the puppy's face is closer to its adult size before doing the normal entroprian surgery which does require the removal of tissue from the eyelid, sort of like an eyelift for a human. There are medicines that you can get to put in the eye to help prevent the scratching of the eye's surface, but if the vet is recommending the surgery this soon, your pup may have a more serious case in that eye. I would get a second opinion though and also, I'd want to really understand which surgery the vet is talking about. Thank you both for your reply! To be honest I am not sure which one of the two it is or I did not understand correctly when he said it. But from your saying and the vet's 15 minutes procedure it must be an entropion. I will clarify with the vet when I take him for his 3 months vaccination which is next week and let you know. I will also get a second opinion. Thank you for your time. Good luck. It is a pretty "routine" surgery so hopefully all will go well. I will be thinking good thoughts for him. Please let us know how it works out. I will! Thank you very much for the good thoughts! Hopefully all will turn out well and he feels better after it. 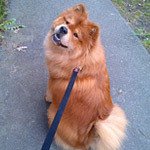 If you can take your chow to a charity vets,you will probably get a different response. We had the same advice from a vet,he couldn't wait to get Rio under the knife,we took him to a charitable vets (the type that take donations) and the advice there was that they could see nothing wrong with his eye other than he was a puppy and his face was still quite scrunched up. Needless to say we didn't have any surgery and Rio who is now almost one has perfect eyes. Good luck with the surgery and/or the 2nd opinion if you take Rio's advice. And not to hijack the thread but, hi Rio, where have you been? We've missed you around here. I thought I replied to this, but since I'm new to the forum I probably thought I did. Drogo had the entropion surgery the last week of January and we removed the stitches on Monday. His eye looks really good now and has stopped running. The hair around the eye is now totally dry. He was slightly sleepy when I brought him home but then seemed great andstopped scratching his eye (vet said that the stitches pain was much less than the pain he had before the surgery so he just ignored it). Was crying a bit during the stitches removal but he was really brave too! Thanks to all for your valuable contribution to this post. Congratulations Rio! Boy or girl? let's cross our fingers she might just be a copy of you. Oh my! sorry for getting carried away.